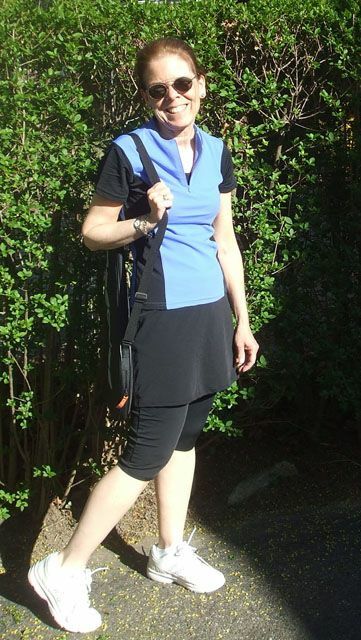 For this post, I chose two garments--the Personal Training Shirt and the Fitness Skirt-Chlorine Proof. I have never been—even way back in my ingénue days—a fan of the classic short, short tennis skirt. And now that I’m over 50, I absolutely refuse to wear the mini skirts! I’m not alone. Women of all ages at my tennis club are opting for a short skirt over Capri or knee-length leggings. (See the photo above of me on my way to a tennis match.) It’s the “it” tennis look this year. Ultra-comfortable for exercising. I didn’t feel the least bit restricted when I was chasing down tennis balls or reaching or bending. The tops come with a separate sports bra. The bra is both supportive and comfortable—a combination you don’t always get with sports bras. Lightweight. I don’t want to wear anything heavy when I’m exercising. HydroChic’s material is lightweight, but strong and supportive. Easy care. I just popped the outfit in the washer on the delicate cycle and then let it air dry. The lightweight material dries overnight. Sporty-looking. I love my top’s colorblock design. It's sporty, stylish and slimming—which I’m all for! HydroChic has activewear suitable for all sorts of exercise--running, jogging, walking, pilates, yoga and on and on. The sporty-looking tops can be matched with a variety of bottoms--skirts with or without leggings, shorts, skorts and pants. The clothing is available in many sizes, including Plus sizes. I know I'll be wearing my outfit on our sailboat this summer. The comfortable fit, ease of motion, and UV resistance are perfect for being out on the water. What's really got me excited, though, is the fact you can wear the garments swimming. Personally, I don’t know any women over 50 who “love” wearing a swimsuit these days. In fact, I know some women who have given up on bathing suits all-together. For those who dread swimsuit season, HydroChic activewear might be worth considering. In fact, the company has just introduced a new line of Chlorine-proof activewear. It's especially made for frequent use in chlorinated pool. To view the entire collection of active wear, visit HydroChic.